How super exciting are all the Christmas products this year! 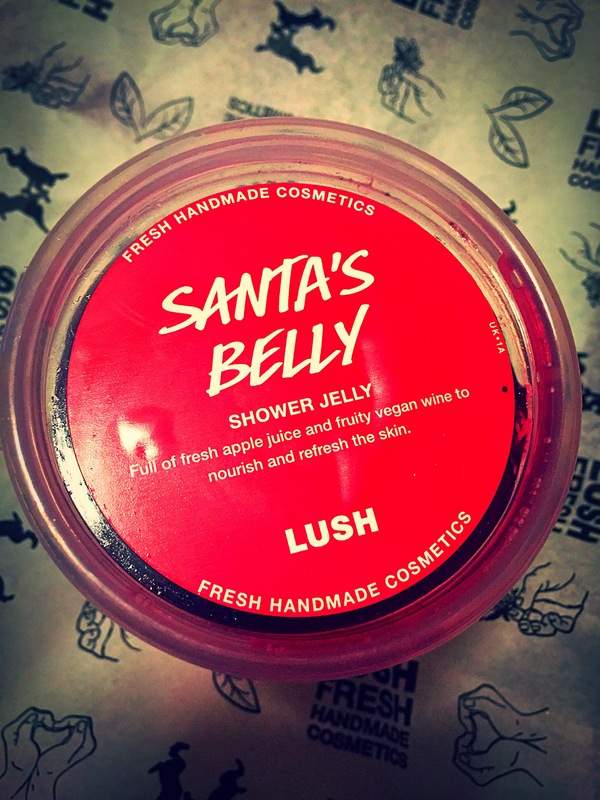 The second product that I tried out this year was the Santas belly shower jelly. I’m such a huge fan of shower jelly, from there quirky concept to just how fun they are you use! So when I saw a new shower jelly was coming out this Christmas I couldn’t wait to get my hands on it. For those of you who haven’t used shower jelly before, they are pretty much what the name says. little pots of jelly that you use in the shower. Strange I know, but one of the best things lush have ever made (in my opinion) . There are lots of different ways that you can use shower jellies from cutting them up to putting them in the freezer and you don’t have to just use them in the shower either, as they can be use to create bubble bath. 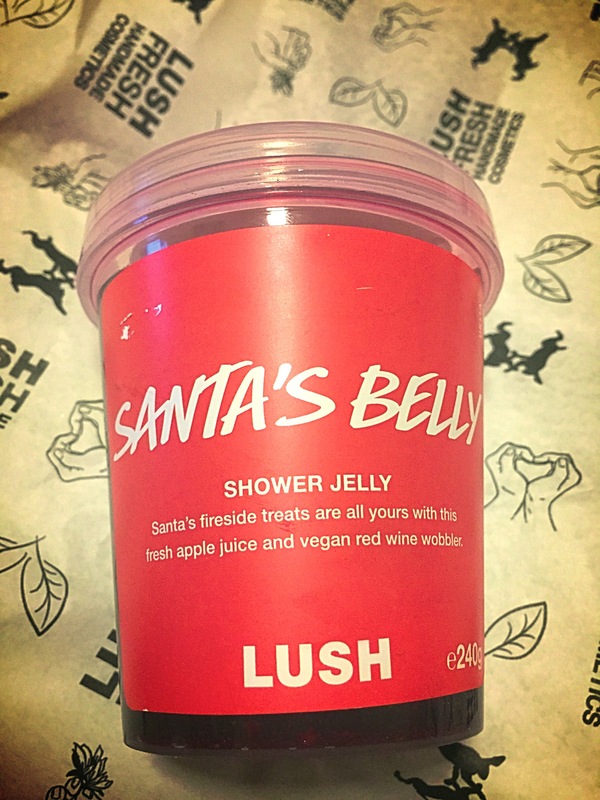 The Santas belly shower jelly is just fantastic, for those of you who love the so white shower gel, you will be pleased to learn that it shares the same scent. Containing lashings of fresh apple juice and vegan red wine this jelly has a very fresh apple based scent, which will leave you feeling refreshed and nourished. Santas fireside treats are all yours with this fresh apple juice and vegan red wine wobbler. 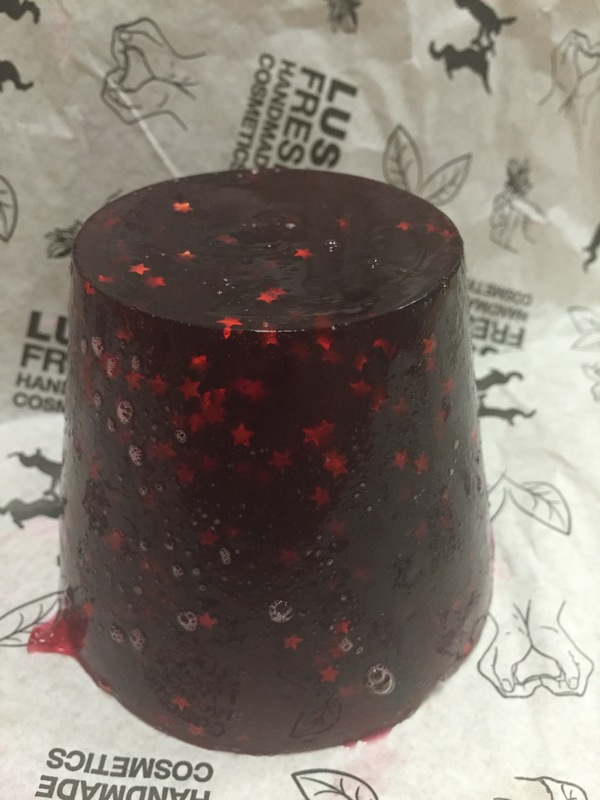 The colour of the Santas belly shower jelly is a beautiful Christmas red (just like the iconic Santas outfit) and features lots and lots of little stars. I found out the little glitter stars are made from seaweed which means they are 100% safe for the environment and don’t make any form of pollution or harm animals (how incredibly amazing is that ). I absolutely love this product and adore it’s fresh scent! I’ve never really been much of a fan of the so white scent but this has defiantly won me over. It’s great to see the so white scent has still made its appearance in a shower product even though the shower gel is not back this year. If you like to make your shower a little bit more exciting this product is for you, as what’s more exciting than washing with a blob of jelly? I also can’t wait to pop this jelly in the freezer as I recon it would be super refreshing when cold. Oh my god, this looks absolutely amazing! It’s absolutely gorgeous isn’t it? I made the Oxford Street trip this weekend and spent way more than I should have – I gave myself the tough choice of whittling down the items in my basket and Santa’s Belly didn’t make the cut as I knew it was coming online soon. I SO regret this decision 😦 Would have gone really well with my So White bath bomb. It is lovely, I totally agree it’s so hard to choose which products to get! You could so easily spend a fortune.